For Linux  - please use 2017.2.1 from this forum thread. For production work the Stable Version of the Unity Editor is 2017.4 - we recommend using versions between 2017.2-2017.4 for maximum compatibility. Unity 2018.1 and 2018.2 support is available in Editor Pack version 14 onwards, and is generally robust. Unity 2018.3 support is also available in Editor Pack 14, but is considered experimental, and bug reports are appreciated. We strongly advise importing the Sinespace Editor Pack into a blank project. Existing assets may incorporate incompatibilities in dependent assets, such as Unity's Post Stack V2 (which we bundle the Sinespace compatible version in our package, ditto Cinemachine.) which can cause conflicts. To import existing content, we recommend creating a blank project, and copy the assets into the new project, if you encounter incompatibilities please let us know! You also need to have Mono installed on OSX for the editor pack to work. 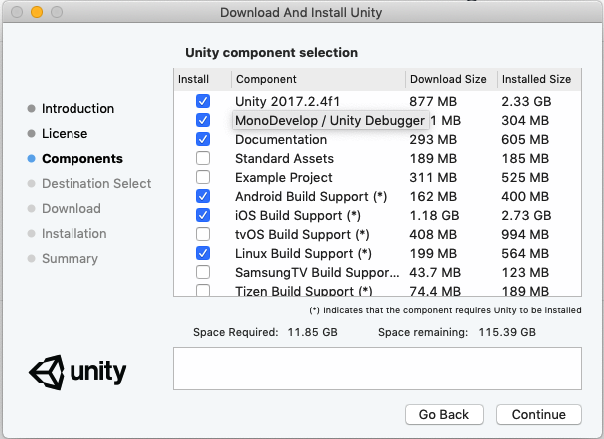 When Unity has finished downloading, click Run to start the installation. 4. After selecting these, click Next and choose your installation location. This will start the download and installation process. Once finished, Unity will be installed.